to think more holistically about technology as not only a set of digital capacities inside heritage organizations, but also as a new and more participative process of how heritage organizations should work in a digital society. But it seems to me that they are struggling to look beyond their “community” of public service. Heritage portals are becoming more important as are online communities of practice. 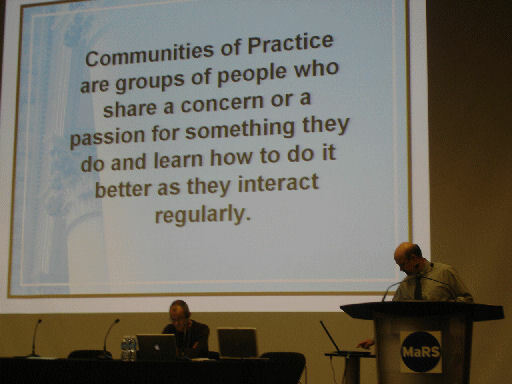 Communiities of practice provide access to relevant and high quality information, but just communication is not enough. Good examples he say, include World Bank’s OneFish; Australian government’s E-democracy. Geographic Information Systems particularly important but under utilised in cultural heritage management. An internal site: Ontario Heritage Portal is integrated information on 10,000 heritage properties. Aimed at supporting work independent of level (gov, local gov, community group etc). Linked to Parks Canada’s historic places website. Still need to answer question of usage of such systems. Q: You showed us use of Google maps – have they looked at a google maps community? A: aiming to use own GIS so can retain within public service. Q: This all seems to be exclusive within public service. A: information is protected (location of sites etc), but some others will eventually be public. ← Will you help me to find the fishmongers hall?